Press release from Broussa Day Nursery. To mark 100 years since the end of World War I, children and staff at Broussa Day Nursery and Nursery School in Hale welcomed grandparents and local community groups to join them for a Remembrance Afternoon. 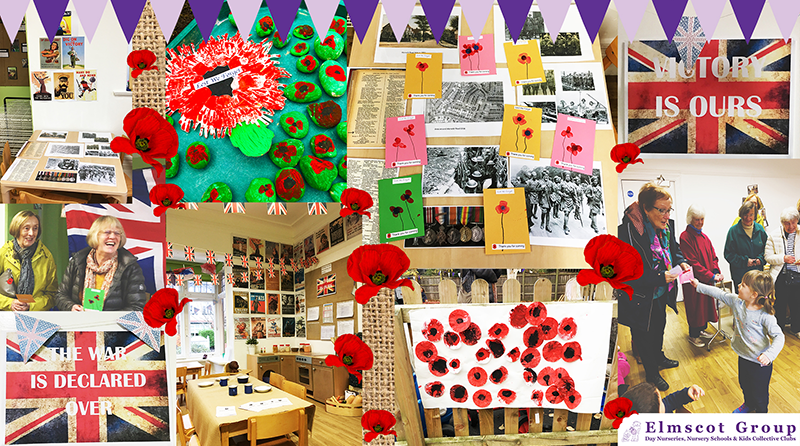 The nursery was beautifully decorated with Union Jack bunting, vintage posters and photos of the soldiers who bravely fought during the war. Vera Lynn music set the nostalgic scene as guests entered the hallway, with wartime-themed areas in each of the rooms. The nursery was joined by some of the children’s grandparents, members of the ‘Young at Heart’ group from St. Peter’s Church in Hale, as well as former Broussa Day Nursery owner Jillian Stopford. During the morning, the children enjoyed the themed role-play areas, as well as making a range of poppy crafts, including paper poppies and thank-you cards for the special guests. As part of the afternoon’s event, the pre-school children laid a wreath and their decorated ‘peace pebbles’ in the garden, before reciting a poem. Everyone who attended then took part in a minute’s silence to remember those who have fought for our country. Nursery Teacher, Mrs Pandor said a few words before inviting guests inside for some afternoon tea. After exploring all of the displays, posters and photographs, thank you cards decorated with finger-paint poppies were handed out to the guests. “We were lucky enough to be joined by Jillian, as well as the local church group and grandparents. It’s a great experience for the children to learn about the history of our country and take part in traditional celebrations.